THREE FIRMS OF ARCHITECTS WERE APPOINTED IN A JOINT VENTURE (JV) TO DESIGN FREEDOM PARK, NAMELY MASHABANE ROSE ASSOCIATES, GAPP ARCHITECTS AND URBAN DESIGNERS AND MMA ARCHITECTS. THE SYMBOLIC FINAL RESTING PLACE FOR FALLEN FREEDOM FIGHTERS WAS DESIGNED CONSIDERING CONCEPTS ARISING FROM INDIGENOUS KNOWLEDGE SYSTEMS (IKS), WITH THE INPUT OF TRADITIONAL HEALERS. THE CIRCLE OF BOULDERS FORMING THE CENTREPIECE OF THE ISIVIVANE , WITH ITS EVOCATIVE MISTING SPRAY, CREATES A SENSE OF A SPIRITUAL PRESENCE ON THE EASTERN SLOPE OF THE SALVOKOP HILL. THE UNDULATING ROCK WALLS, BOULDERS AND ROCK GARDENS ESTABLISHED AN ARCHITECTURAL LANGUAGE THAT INFORMED THE ARCHITECTURE OF THE SUBSEQUENT STRUCTURES OF THE FREEDOM PARK PROJECT. THE SPIRITUALITY THAT IS EVOKED HERE IS FELT AT THE SIKHUMBUTO TOO, WHICH PROVIDES A ‘WALL OF NAMES’ OF THE FALLEN FREEDOM FIGHTERS. PLACING A MEMORIAL, THE SIKHUMBUTHO , ON TOP OF THE HILL WAS INEVITABLE IN THIS LANDSCAPE DOMINATED BY LARGE POLITICALLY-CHARGED BUILDINGS OF THE CAPITAL CITY ON THE SURROUNDING HILLS – THE VOORTREKKER MONUMENT, THE UNISA CAMPUS AND ACROSS THE CBD, THE UNION BUILDINGS. THE PRESENCE OF THIS NEW NATIONAL SYMBOL WITHIN THE CAPITAL NEEDED TO BE SIGNIFICANT. WHAT IS UNIQUE TO FREEDOM PARK IN THIS SETTING IS THE RELATIONSHIP THAT FREEDOM PARK HAS WITH THE LANDSCAPE AND THE SHAPE OF THE HILL. THE PROJECT SETS OUT TO INTEGRATE ARCHITECTURAL ELEMENTS AND SCULPTURE WITH THE LANDSCAPE TO CREATE A UNIQUE PLACE. THE VOORTREKKER MONUMENT, ASSOCIATED STRONGLY WITH THE NATIONALIST REGIME, AND THE UNION BUILDINGS ARE PART OF THE DIALOGUE AND EXPERIENCE OF FREEDOM PARK. THIS RELATIONSHIP FORMS A NARRATIVE JOURNEY THROUGH THE LANDSCAPE. FRAMED VIEWS OF SIGNIFICANT PLACES ARE MARKED ON THE SPIRAL PATH AND STORYBOARDS UNPACK THE HISTORY OF THIS SITE FOR THE VISITOR. THE PRIMARY ELEMENTS OF FREEDOM PARK ARE CONNECTED IN A SEQUENCE AS YOU RISE UP THE HILL FROM THE ENTRANCE AT THE BASE. THE //HAPO (MUSEUM) DEFINES THE MAIN ENTRANCE AND CONNECTS THE SITE WITH SALVOKOP VILLAGE AND THE CITY VIA A PUBLIC ARRIVAL SQUARE. GROUPS ASSEMBLE IN THE SQUARE BEFORE AND AFTER VISITING FREEDOM PARK. AS PART OF A BROADER NARRATIVE OF RECONCILIATION, A ROAD WAS BUILT TO CONNECT THE VOORTREKKER MONUMENT TO FREEDOM PARK – CONNECTING THE HISTORIES AND ALLOWING VISITORS TO TANGIBLY APPRECIATE THE DIVISIONS OF THE PAST AND TO PROMOTE SOCIAL COHESION IN THE PRESENT AND FUTURE. THE PROJECT NEEDED TO ENCOMPASS MANY VOICES, IDENTITIES AND COMMUNITIES THAT MAKE UP SOUTH AFRICA. IT NEEDED TO BE A PLACE THAT IS TIMELESS AND THAT ENCOMPASSES ALL SOUTH AFRICANS, REFLECTING AN OPEN RELATIONSHIP WITH ITS CITIZENS IN THE POST-1994 LANDSCAPE – A PLACE OF RECONCILIATION AND NATION-BUILDING. THE DESIGN PROCESS OCCURRED OVER A LONG PERIOD AS A CONSEQUENCE OF THE EXTENT AND DEPTH OF THE CONSULTATIVE PROCESS AND THE ONGOING RESEARCH INTO IKS. THE PROCESS OF COMPILING THE ‘WALL OF NAMES’ AT THE TOP OF THE HILL REQUIRED A LENGTHY VERIFICATION PROCESS. THE PROJECT IS SIGNIFICANT IN ITS EFFORT TO CONSULT WIDELY WITH TRADITIONAL HEALERS, POLITICAL LEADERS, TRADITIONAL STRUCTURES AND RURAL COMMUNITIES, PROBABLY THE FIRST TIME THIS WAS DONE IN THE COUNTRY. IT PRODUCED A UNIQUE STORYLINE AND HELPED DEFINE THE ARCHITECTURE. THE TEAM OF ARCHITECTS WERE ENCOURAGED TO ENCOMPASS IDEAS THAT AROSE FROM RURAL ARCHITECTURE, TRADITIONAL HOMESTEAD DESIGN AND IKS, TO CONSIDER THE UNIQUE ARCHITECTURAL STRUCTURES AND URBAN FORMATIONS FROM SITES ACROSS SOUTHERN AFRICA, INCLUDING MAPANGUBWE, GREAT ZIMBABWE AND THE MOUNTAINS IN THE FREE STATE. THE CONVERSATION CHALLENGED THE ARCHITECTURAL TEAM TO SEARCH FOR ESSENTIAL AND UNIVERSAL QUALITIES IN ARCHITECTURE TO ANSWER THE COMPLEX PROCESS OF A LARGE CLIENT BODY WITH A RANGE OF OPINIONS. THE FREEDOM PARK TRUST (FPT) LEADERSHIP ENCOURAGED CREATIVITY IN THE MIDST OF THE ONGOING CONVERSATION ABOUT WHAT IS AFRICAN ARCHITECTURE AND WHAT SYMBOLS ARE APPROPRIATE TO THE PROJECT. THE FPT ARRANGED A SIGNIFICANT FACT-FINDING VISIT TO A TRADITIONAL HEALER’S HOMESTEAD IN KURUMAN TO DEVELOP AND UNPACK SOME OF THE ARCHITECTURAL QUESTIONS THAT AROSE – THESE VISITS WERE A TURNING POINT IN THE DESIGN OF //HAPO IN PARTICULAR, WHICH IS DISCUSSED LATER IN MORE DETAIL. ESSENTIAL ARCHITECTURAL ELEMENTS WERE DISCUSSED AND USED – STONE, WATER, FIRE AND INDIGENOUS TREES AND PLANTS. A TANGIBLE RESPECT FOR THE CULTURAL, HISTORICAL AND NATURAL LANDSCAPE OF THE HILL-TOP SITE NEEDED TO BE EXPRESSED. IKS OFFERED CLUES TO THE FORM AND SPACES OF THE PROJECT AS THE PROCESS UNFOLDED. DR HARRIET NGUBANE, A RESPECTED SOCIOLOGIST AND ADVISER TO THE FPT, RELATED SEVERAL STORIES THAT WERE CONSISTENT WITH SOUTHERN AFRICAN INDIGENOUS CULTURE. THE CONCEPT OF THE REEDS, WHICH GAVE THE HILL-TOP SITE ITS VERTICAL ELEMENTS, AROSE FROM THESE EVOCATIVE STORIES THAT SHE SHARED WITH THE TEAM. IN PARTICULAR, THE AFRICAN STORY OF CREATION SUGGESTED THAT THE REED WAS A CONDUIT TO LIFE AND COULD BE USED AS A SCULPTURAL ELEMENT WITHIN SIKHUMBUTHO TO EXPRESS A CONNECTION BETWEEN THE EARTH AND THE SKY. VISUALLY, IT ANSWERED THE PROBLEM OF NOT HAVING A HEAVY VISUAL WEIGHT AND WAS AN EXPRESSION WHICH WAS LYRICAL AND SIGNIFICANT. THE EPHEMERAL STAINLESS-STEEL ‘REEDS’ EVOKE A SENSE OF THE SPIRITUAL PRESENT IN THE ISIVIVANE COMPLETED EARLIER AND METAPHORICALLY CONNECTED THE EARTH TO THE HEAVENS ABOVE. IT BECAME A TRADEMARK OF FREEDOM PARK THAT THE ONGOING CONVERSATION AROUND THE SITE’S ARCHITECTURAL ELEMENTS HAD THEIR ROOT IN A UNIQUELY AFRICAN STORY OR SYMBOL. THE SIKHUMBUTHO SERVED AS A COUNTERPOINT TO THE DOMINATING HILL-TOP STRUCTURES OF THE VOORTREKKER MONUMENT AND UNISA CAMPUS SURROUNDING IT, EMERGING FROM THE LANDSCAPE AS IF CARVED OUT OF IT, BLURRING THE LINE BETWEEN LANDSCAPE AND ARCHITECTURE. THE IDEA OF THE SPIRAL PATH THAT LEADS VISITORS UP TO THE TOP OF THE HILL CREATED A PILGRIMAGE ROUTE UP TO THE NAMES OF FALLEN FREEDOM FIGHTERS AT THE APEX. THIS CONCEPT WAS EXPANDED BY THE FPT TO INCLUDE EARLIER CONFLICTS, INCLUDING ACTS OF GENOCIDE AGAINST THE SAN, THE FRONTIER WARS, SIGNIFICANT BATTLES, SOUTH AFRICA’S INVOLVEMENT IN BOTH WORLD WARS LEADING UP TO THE LIBERATION STRUGGLE AGAINST APARTHEID. FORMER PRESIDENT THABO MBEKI HAD A SUBSTANTIAL INFLUENCE IN SEEING THAT THE PROJECT ENCOMPASSED THIS BROAD HISTORY OF SOUTH AFRICA. THE ‘WALL OF NAMES’ LEADS YOU ROUND TO A CHAPEL-LIKE CHAMBER FORMED IN THE DEPTH OF THE WALL FOR CEREMONIES AND MEMORIAL SERVICES. A FLAME BURNS PERMANENTLY AS A CONTINUOUS REMINDER OF THE ULTIMATE SACRIFICE INDIVIDUALS MADE TO ACHIEVE FREEDOM. THE LANDSCAPE-COVERED AND ROCK-PACKED ROOFS THAT CURVE AROUND THE HILL ALSO INCLUDE AN INDOOR CURVED, WALK-THROUGH HALL THAT IS DESIGNED TO ACCOMMODATE AND REMEMBER LEADERS WHO ASSISTED SOUTH AFRICA DURING THE LIBERATION STRUGGLE. THE SPACE IS DRAMATICALLY SHAPED AND CURVED AROUND THE WEST SIDE OF THE HILL TOP AND HAS TILTED CONCRETE COLUMNS THAT CONSPICUOUSLY HOLD UP THE HEAVY CONCRETE ROOF, LENDING EMOTIVE STRENGTH TO THE CURVED INTERIOR. THE WORD ‘MUSEUM’ WAS REPLACED WITH A KHOI WORD REFERRING TO ‘DREAM’ – //HAPO. THE //HAPO SPATIAL STRATEGY CONSISTS OF A SERIES OF SPACES ARRANGED ALONG A TIMELINE TO ENCOURAGE A DIALOGUE BETWEEN CORE EXHIBITION AND TEMPORARY EXHIBITION SUBJECTS. THE PROJECT HAS A LIBRARY, SEMINAR ROOMS, ADMINISTRATION OFFICES, ARCHIVES AND OTHER VISITOR FACILITIES, SUCH AS A COFFEE SHOP AND BOOK SHOP. THESE FACILITIES ARE SEPARATELY ACCESSIBLE FOR EVENTS AND CAN BE APPROACHED FROM THE PUBLIC SQUARE. THE BRIEF PROMOTED EXHIBITION SPACE THAT USES STORYTELLING AND STORYTELLERS. IT WAS FELT THAT THIS DEVICE WOULD MAKE THE MUSEUM UNIQUELY AFRICAN BECAUSE ORAL HISTORIES ARE PASSED ON OVER THE YEARS FROM ONE GENERATION TO THE NEXT. 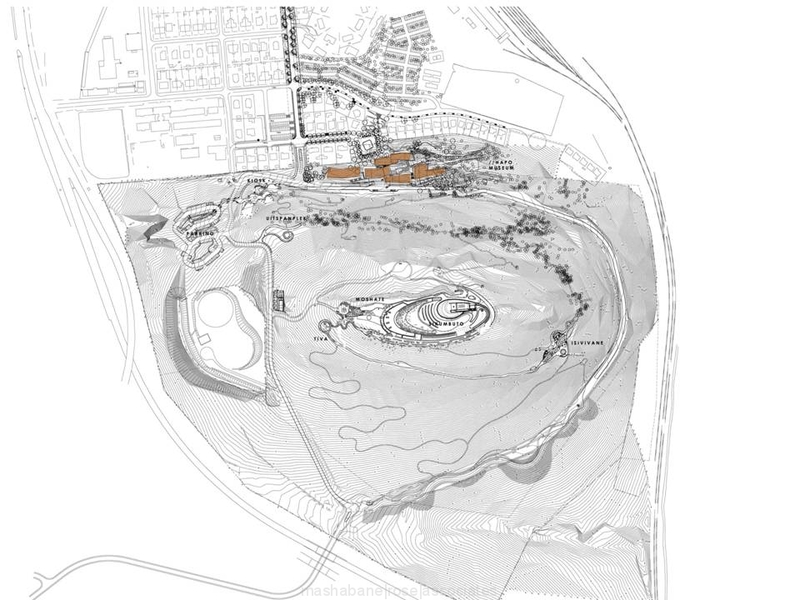 THE FIRST DRAWN CONCEPTS OF THE MUSEUM WERE BASED ON THE IDEA OF FORMING CRACKS AND CREVICES SIMILAR TO THOSE FOUND IN THE ROCK OUTCROPS ON THE HILL. A MORE SINUOUS WALL CONCEPT EMERGED IN THE SECOND SCHEME DESIGN, WHICH WAS BASED ON A LONG WINDING WALL LINE THAT LEADS YOU THROUGH THE DIFFERENT STORYTELLING SPACES AROUND A COURTYARD CARVED INTO THE HILL WITH PLANTED ROOFS. A FEELING OF THE BUILDING BEING CARVED INTO THE HILL WAS EXPLORED. THE PROCESS OF DEVELOPING THE DESIGN FURTHER PAUSED FOR A WHILE AS THE CLIENT ENGAGED IN A MORE DETAILED BRIEF-WRITING PROCESS AND ULTIMATELY PRODUCED A DOCUMENT THAT ADDRESSED MANY OF THE ISSUES THAT WERE IMPORTANT TO THE FPT. PART OF THIS PROCESS INVOLVED A VISIT TO THE ZULU SANGOMA VUSAMAZULU CREDO MUTWA IN KURUMAN TO DISCUSS SEVERAL ISSUES, INCLUDING ARCHITECTURE IN RURAL COMMUNITIES. THE VISIT WAS HELD IN HIS CIRCULAR-ROOMED RONDAVEL WITH A BENCH ALONG THE PERIMETER. THE GARDEN AT MUTWA’S HOMESTEAD IS FILLED WITH PLANTS GATHERED AND GROWN FOR THEIR HEALING PROPERTIES. THE SMALL GARDEN HAS LARGE BOULDERS THAT ARE SURROUNDED BY THE PLANTS. THE GARDEN AND ITS BOULDERS HAD A PROFOUND EFFECT ON THE DESIGN CONCEPT; THE DRAWING THAT FOLLOWED (DRAWN ON THE BUMPY PLANE RIDE BACK FROM KURUMAN) BECAME THE IMAGE WHICH DROVE THE DESIGN PROCESS FORWARD. THE IDEA OF A SERIES OF LARGE ROCKS OR BOULDERS SURROUNDED BY HEALING PLANTS BECAME THE PRIMARY IDEA OF THE //HAPO SCHEME. IT WORKED AT MANY LEVELS. THE SIMILARITY WITH THE ISIVIVANE ROCKS FOUND ON THE HILL FURTHER MADE THIS CONCEPT WORKABLE. THE BUILDING WAS SEEN AS A MULTI-FACETED, BOULDER-SHAPED FORM, WHERE THE CRACKS AND CREVICES WERE DEVELOPED TO ALLOW LIGHT INTO THE TALL CAVE-LIKE VOLUMES INSIDE, WITH LIMITED NATURAL LIGHT BREAKING THE SURFACE AND ILLUMINATING THE VOLUMES. THE EXHIBITION SPACES INSIDE THESE BOULDERS WERE LINKED WITH LOW COMPRESSED SPACES, ATTEMPTING TO SPATIALLY CAPTURE THE NOTION THAT A SERIES OF HISTORICAL EPOCHS WERE DISTINGUISHED FROM EACH OTHER BY SOME QUALITATIVE SHIFT. THE IDEA, WHICH WAS ROOTED IN THE AFRICAN LANDSCAPE, IS SYMPATHETIC TO IKS AND HAD A MEMORABLE AND UNIQUE IMAGE. IT QUICKLY BECAME KNOWN AS THE ‘BOULDER’ SCHEME. THE IDEA NEEDED TO MOVE INTO BEING A BUILDING AND NOT JUST AN IDEA AND WORK BEGAN ON HOW TO ACHIEVE THE APPEARANCE OF BOULDERS WITH THEIR CRACKS AND DISCOLOURATION. THE ROCK ON SITE IS A CONTINUOUS, MULTI-FACETED SURFACE AND A PLIABLE METAL SURFACE WAS PROPOSED THAT COULD BE BOTH A ROOF AND WALL SURFACE, WHICH WOULD BEST EXPRESS THIS CONTINUOUS AMORPHOUS ROCK SURFACE. COPPER SHEETING WAS FAVOURED AS IT IS AN AFRICAN MATERIAL THAT IS MINED LOCALLY AND WHEN EXPOSED TO THE ELEMENTS, CHANGES COLOUR. IT SEEMED POETICALLY IN SYNC WITH THE PROCESS OF HISTORY BEING RECORDED AND DOCUMENTED AT //HAPO. THE LITTLE RED-BRICK HOUSES OF THE SALVOKOP VILLAGE BACKED ONTO THE SITE AND PUBLIC SQUARE, AND THE RED BRICK FOUND HERE WAS PULLED ACROSS THE SQUARE AND FOLDED UP TO FORM THE PLINTH ON WHICH THE BOULDERS WERE SET. THE MONOCHROMATIC SURFACE HAS THE EFFECT OF BINDING THE //HAPO TO ITS HILLY LANDSCAPE. THE BOULDERS ARE SET AT SEVERAL LEVELS AND THE JOURNEY THROUGH THE EXHIBITION SLOWLY RISES AS YOU WALK THROUGH. THE GARDEN IN THE CENTRE OF THE BOULDERS IS VIEWED FROM SEVERAL VANTAGE POINTS AND REMINDS YOU OF THE PLANTS THAT GROW THROUGH THE CREVICES OF THE ROCKS ON THE HILL.